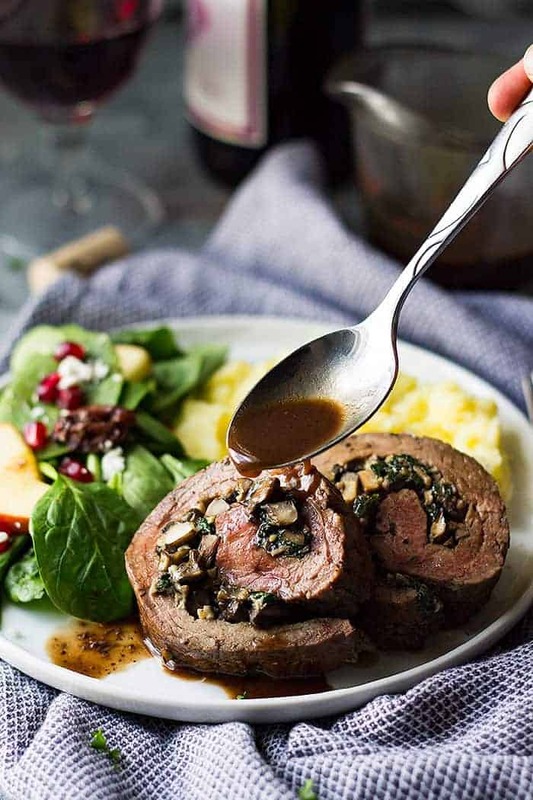 This Mushroom and Blue Cheese Stuffed Flank Steak is the perfect meal for a small scaled party. 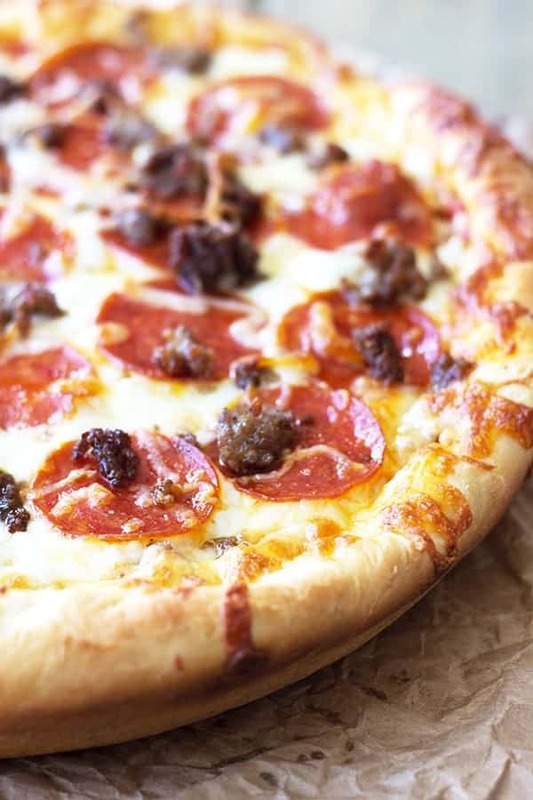 It’s full of flavor, easy to prepare, and guaranteed to impress! 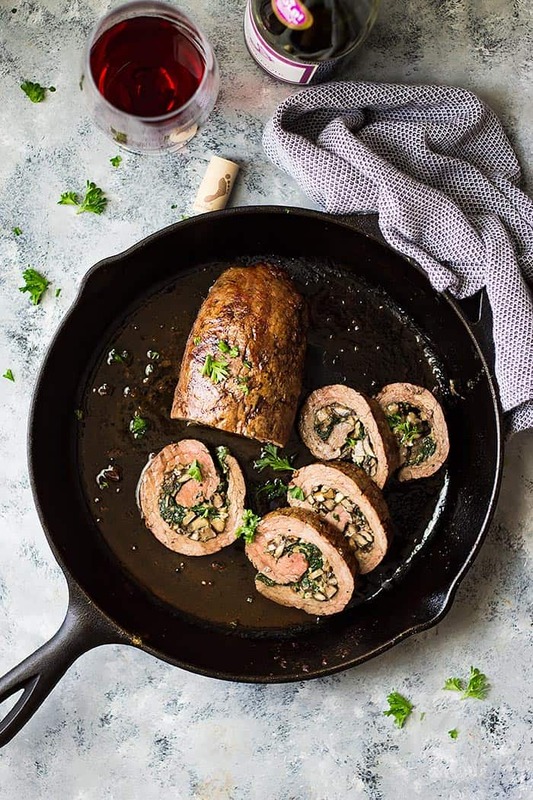 You guys…..this mushroom and blue cheese stuffed flank steak is an easy recipe, I promise and it’s perfect for a small scaled party. It would be a great dinner for Christmas! And if you don’t like blue cheese, no worries swap it out for goat cheese. 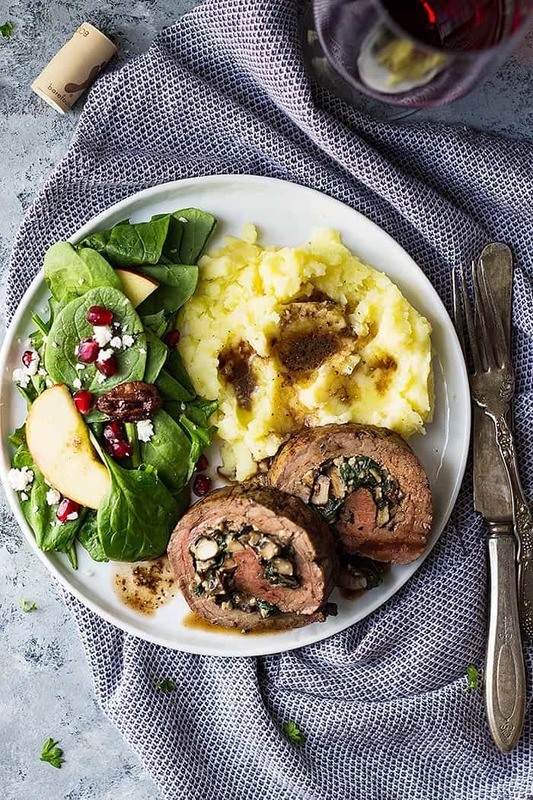 I’ll be honest I don’t like blue cheese at all but I don’t mind it in this stuffed flank steak! It’s not overpowering like blue cheese can so easily be but if you really don’t think you would like the blue cheese it’s just as good with goat cheese which is much milder. 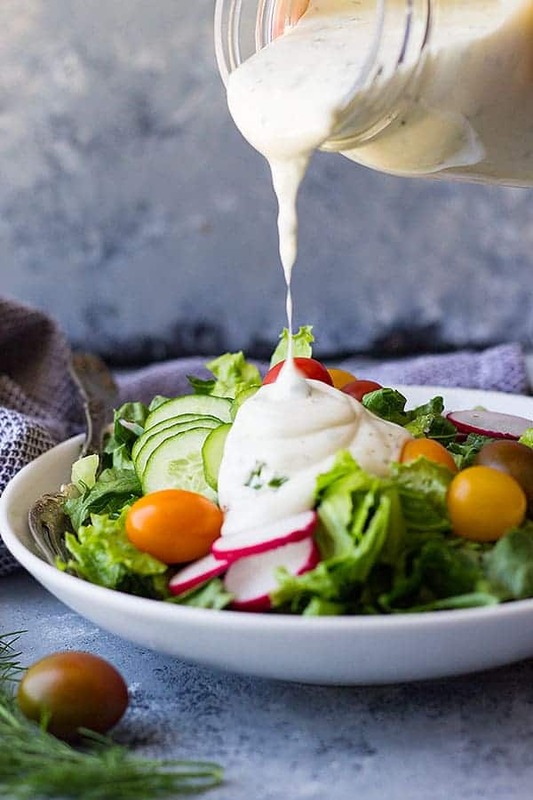 This would be great served with this Spinach, Apple, and Pomegranate Salad, Skillet Garlic Green Beans, Slow Cooker Mashed Potatoes, or Slow Cooker Baked Potatoes. 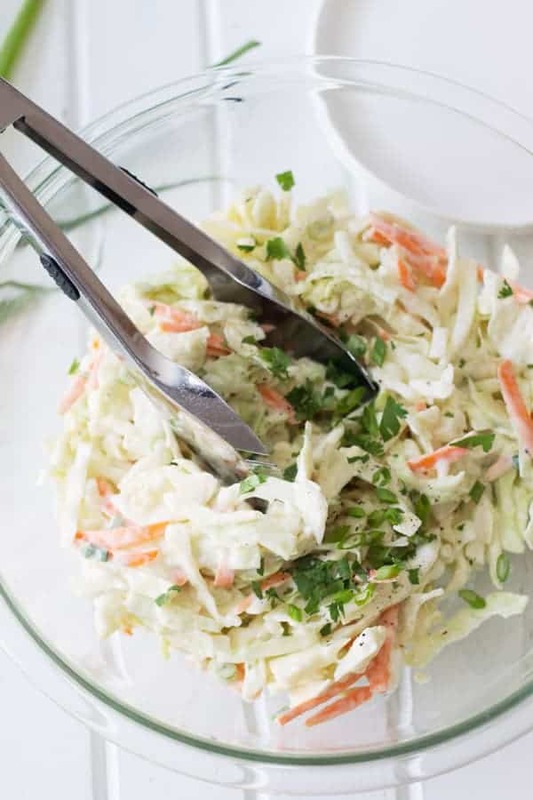 Trust me on this when I say that this recipe is easy because it is!! If you can pound out a flank steak, roll it up with some delicious ingredients and sear this in a pan, you can make this. I wanted to make one more option for your Christmas dinner. I know this is the week of Christmas and most of you (if not all of you) already know what you are going to make, but just in case if someone is still searching for that perfect dinner—this is it!!! 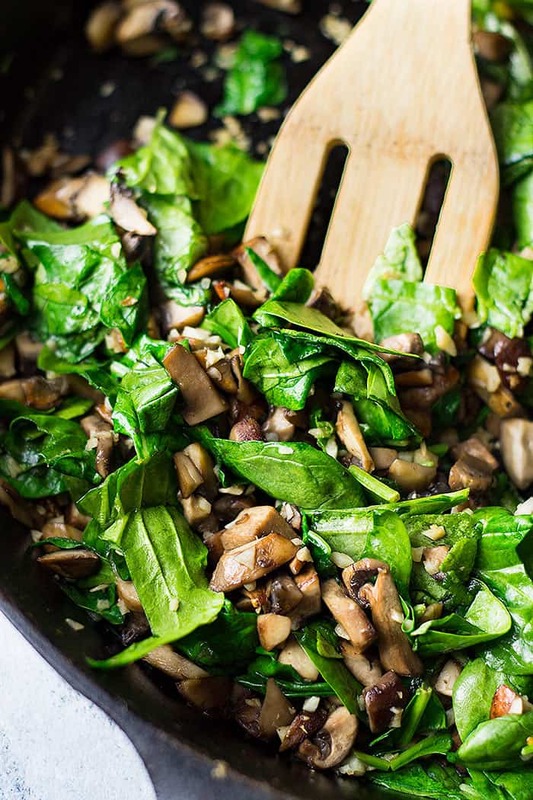 Next, add your sauteed mushrooms, garlic and spinach and spread to an even layer. Sprinkle with the blue cheese and roll it up. Secure with toothpicks and sear in a hot pan. 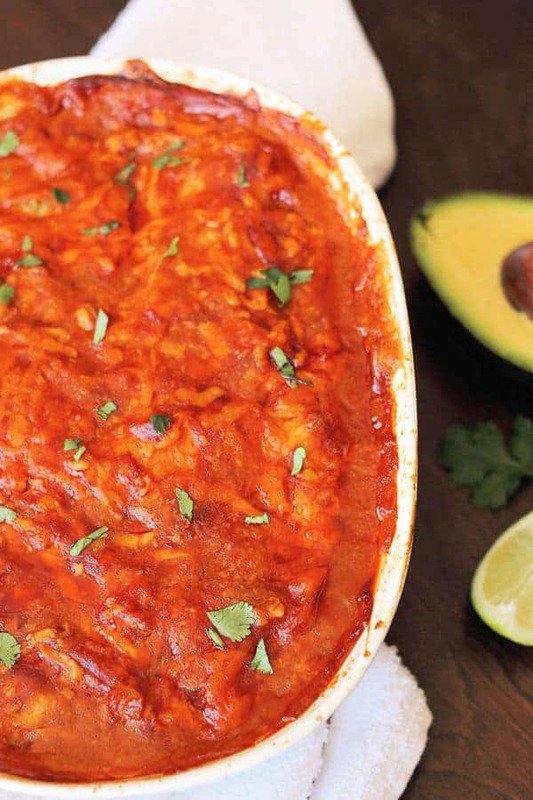 Toss this beauty in the oven and you’re on your way to one elegant meal. I also made a very, very simple red wine sauce to go with that I highly recommend you make. I don’t recommend cooking this until well done, the meat is too tough, in my opinion. Feel free to sub out the blue cheese for goat cheese if you prefer. This recipe is a very rich and filling meal, a little goes a long way, in my opinion. So, I think you could feed 6 adults with sides just fine. Christmas dinner menu option: Mushroom and Blue Cheese Stuffed Flank Steak, Spinach, Apple, and Pomegranate Salad, Skillet Garlic Green Beans, Slow Cooker Mashed Potatoes, or Slow Cooker Baked Potatoes. Dessert options: Fruit Tray, Bread pudding or Easy Pumpkin Cake with Cream Cheese Frosting. Mushroom and Blue Cheese Stuffed Flank Steak- this is a super easy recipe that is guaranteed to impress! Place the flank steak on a large cutting board. Using a meat tenderizer, pound out to roughly a 10x13 size. Season with salt and pepper; set aside. In a large skillet heat 1 tablespoon of butter and 1 tablespoon of olive oil over medium to medium low heat. Add mushrooms and cook 5-7 minutes or until browned. Add garlic and cook and stir for 2 minutes. Stir in spinach and remove from heat. Spread over seasoned beef. Sprinkle with cheese. In a large oven proof skillet heat the remaining butter and oil over high heat. When the oil starts to ripple carefully place the meat in and sear until lightly browned on all sides. About 2-3 minutes on each side. Remove from heat and add the beef broth. Bake for 25 minutes or until a meat thermometer reads 145 degrees F (medium rare) or to your desired degree of doneness. Remove from pan and let rest 15 minutes before slicing. Meanwhile, make the red wine sauce. In a medium saucepan add in drippings, broth and red wine. Bring to a boil and boil for 10 minutes or until reduced by half. Remove from heat and whisk in the butter. Season with salt and pepper. Serve over sliced meat. I used an inexpensive brand of blue cheese so it wasn't very strong. If you are using a more expensive brand you may want to cut back on the amount of cheese you use. If you don't like blue cheese at all feel free to use goat cheese. Mushroom and Blue Cheese Stuffed Flank Steak, Spinach, Apple, and Pomegranate Salad, Skillet Garlic Green Beans, Slow Cooker Mashed Potatoes, or Slow Cooker Baked Potatoes. Dessert options: Fruit Tray, Bread pudding or Easy Pumpkin Cake with Cream Cheese Frosting. My parents would love this! They’re growing mushrooms and need many ideas on how to use them! Thanks Aria! I hope they enjoy it! Can you substitute another cheese? Sure, I think that would be fine! I hope you enjoy! It’s great to take the focus away from turkey here and there, especially around the Christmas season. These look amazing! Mushrooms and Blue Cheese are a couple of my husbands favorite foods! I will be making this for him very soon! I have never made something that looks this fancy, but seems this easy! Looks amazing! That’s the best part, looks fancy but really easy! WOW! This is absolutely stunning! What a fabulous centerpiece for a holiday meal… or any type of celebration! No worries, just sear the meat as directed then place in a baking dish to transfer to the oven and continue as directed. It may take a little longer to cook.